Before planting a clematis vine you'll want to select the right variety for the right spot. 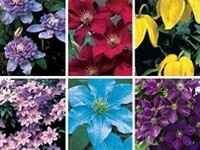 Not to long ago there weren't many varieties of clematis available on the U.S. market. That has changed over the past few decades and now there are hundreds of varieties to choose from. Local nursery and garden centers might offer dozens of different varieties. Mature Height - Heights range from just a few feet for smaller gardens to over 20 feet for large gardens. Flower Form - The standard clematis flower form is a large blossom with six or seven petals, measuring 5-6" across. There are also cultivars with smaller blossoms, double blossoms, and lovely bell-like flowers. Color - Clematis come in a multitude of colors ranging from white to yellow, light red to deep wine red, soft lavender to deep purple, soft pink to deep pink, and many varieties of bicolor, ones with striped petals! NOTE: It can take several years for a clematis vine to mature and begin flowering vigorously. To shorten the wait and help ensure your success, it's best to purchase a plant that's at least two years old. Look for a container-grown plant in a quart to one or two gallon size pot. If you're shopping for your clematis at a garden center or nursery, select a robust plant that's showing vigorous growth, rather than a weak plant with a beautiful picture. With the exception of a few varieties that will tolerate shade, most clematis varieties like the sun. So, ideally, pick a sunny spot that provides at least 6 hours of sun each day. Clematis prefer moist, well-drained soil so pick a spot where the soil doesn't stay constantly wet or soggy. If you dig a 12-inch deep by 12-inch wide test hole in an area and fill it with water it should drain within at least 6 hours or so. If not, you'll need to take steps to improve drainage. This can be accomplished by raising the planting bed to a height sufficient to keep the roots out of water. Clematis prefer a neutral to slightly alkaline soil pH. If your soil tends to be acidic, apply pelletized lime to sweeten it. Clematis roots like it cool and damp, but not soggy. A good idea is to plant annuals around the base of the clematis, plant a low growing shrub to shade the roots, or mulch the ground around the base of the clematis plant to help keep the soil and roots cool. Clematis roots are long and run deep. So the wider and deeper you dig the planting hole the better. I would recommend a hole at least 24 inches in diameter and 24 inches in depth. If you're planting in clay or other dense soil it's a good idea to thoroughly mix in a good organic compost at a 50/50 ratio with the native soil removed from the planting hole. Composted manures, mushroom compost or your own homemade compost will do. Gently remove the rootball from the container it was growing in and then gently set the rootball in the planting hole so that its top edge is slightly below ground level of the planting area. I usually plant about 1-ich below ground level so that the first set of true leaves or leaf buds are just under the soil surface. When backfilling around the root ball you will cover up one or two sets of leaves. You do not need to remove the leaves. Shoots will appear from under the ground from these nodes that are covered with soil, creating a bushy plant from the base. Also if the plant is ever broken off at ground level it will not be lost as it will shoot up from under the ground. NOTE: Be very gentle when settling the plant into its new home; the roots, crown and emerging vines of clematis can be easily broken. 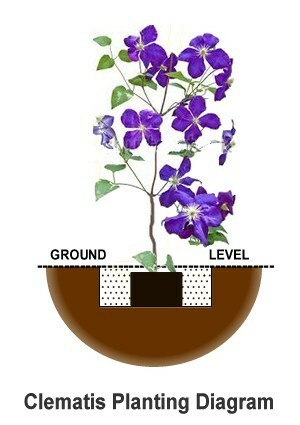 If necessary, place more of your soil mixture in the bottom of the hole to obtain correct planting height. If you properly care for your newly planted clematis during the first growing season chances are good it will continue to thrive for years to come. Water as necessary to keep the soil moist but not soggy wet during the first growing season. Mulching around the base of the plant will help conserve moisture and reduce competition from weeds. Be sure not to place mulch directly against the base of the vine...leave several inches of space. Clematis like their roots to be cooler and their foliage to be warmer. Mulch helps to achieve this as will foliage of low-growing plants planted around the vine. With the exception of a few varieties of clematis that have a bushy habit of growth, most are climbing vines. The leaf stems of clematis will look for something to grab on to. So you'll need to have some sort of support structure for the vine to climb. If you have a chain link fence or a trellis that's great. Just make sure you provide it with something to climb on from day one. Because the leaf stems of clematis are not very long, anything that's more than about 1/2 inch in diameter is too wide for the leaf stem to twist around. The easiest things for a clematis to grab onto, are twine, fishing line, wire, thin branches, wooden dowels or steel rods. The more grabbing opportunities you offer, the better, so even if you have a nice trellis, consider adding some twine "helper" lines, or covering your trellis with a grid of trellis netting. Loose vines can be wound around supports, or tied to supports using growers twine. NOTE: Stake newly planted vines using bamboo stakes or wrap a piece of screen loosely around vine to prevent animals from breaking or eating off the stem for the first year. The stake should be placed toward the trellis, to train the plant to its permanent support.